Ever since Hurricane Maria struck Puerto Rico, Jodie Roure, Associate Professor of Latin American and Latina/o Studies at John Jay, has been instrumental in the island’s recovery. Initially, she led the Doctors for Maria Relief efforts and brought 25 doctors and nurses to the island. Now, more than a year after Hurricane Maria, with the people of Puerto Rico still feeling the effects of one of the deadliest Atlantic hurricanes in history, Roure has collaborated with the medical community in hopes of providing the island’s people with the continued medical care they need. 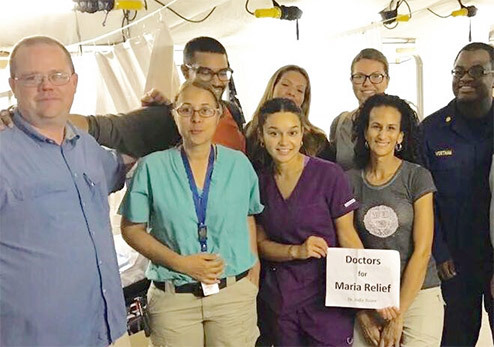 Inspired by the devastation of Hurricane Maria, Roure, the doctors, along with their Operation Giving Back (OBG) program, has made it their mission to provide aid to countries after natural disasters, and lend a voice to the humanitarian culture. On September 20, 2017, Puerto Rico was struck by a catastrophic category four hurricane that left the island struggling to survive. “Hurricane Maria caused over 3,000 fatalities by current tallies, over 100 billion dollars in damages, and was the cause of the longest blackout in US history,” said Dr. Dolich. “There was disruption of the electrical grid, water supply, cellular communications, and the island’s infrastructure created issues with medical care. Hospitals were running on backup generators, there were access problems for patients and there was a ‘Puerto Rican diaspora.’” Explaining this diaspora, Puerto Rico’s Secretary of Health spoke about the island’s lack of healthcare professionals. “Congress had previously passed a law called Puerto Rico Oversight, Management, and Economic Stability Act (PROMESA), which granted medical professionals the ability to leave the island to work in 12 U.S. states with their medical license from Puerto Rico,” said Dr. Rodríguez Mercado. “Since people started to migrate to the [continental] United States, we had a medical challenge on the island, especially in the areas where the people are underserved.” When the ACS put out a call to action after Hurricane Maria, over 450 fellows signed up to volunteer in Puerto Rico. 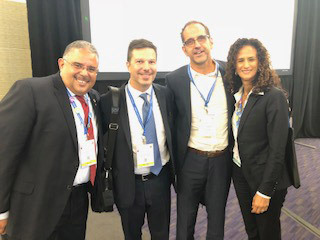 Understanding the island’s need for medical assistance, three weeks after the hurricane, Roure and an exploratory team of ACS Fellows, traveled to Puerto Rico to provide much needed relief and during that time conducted an exploratory study to initiate a free surgical program. Eager to continue their humanitarian efforts, OGB and ACS are working together to offer a free surgical program. This program will give students the chance to volunteer in the medical community with a future goal of creating a medical diversity pipeline program for the students. 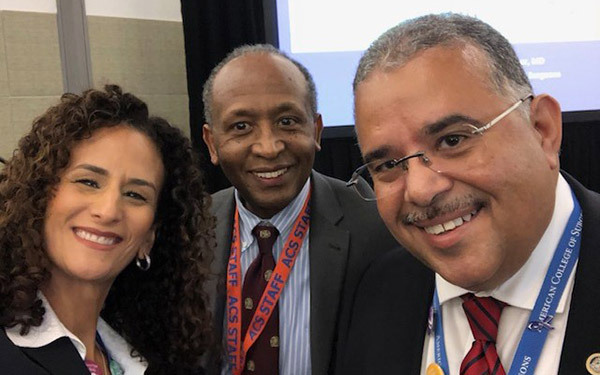 “After a decade of experience, we’re demonstrating how medical organizations can work together to create a pipeline of the next generation of health care providers,” said Dr. Barry D. Mann, program director, general surgery residency training program, Lankenau Medical Center, Wynnewood, PA. Appreciative of the relief efforts in Puerto Rico, Dr. Rodríguez Mercado hopes that the creation of this program is long lasting. “The feel is that once we establish this program, there will be continuity. We need to make sure that the people who come after me continue to work in collaboration with the American College of Surgeons,” he said. 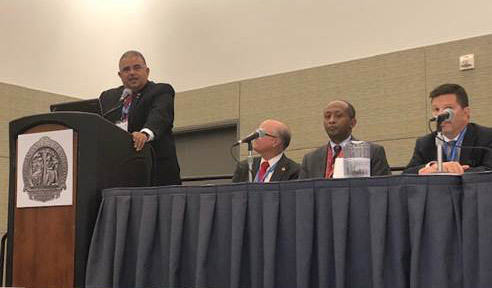 Dr. Rafael Rodríguez Mercado, announcing the free surgical program with Dr. Girma Tefera and Dr. Matthew Dolich. To learn more about Roure’s work in Puerto Rico, and how she began her career in human rights, watch the videos below.